Nearly four months after being damaged in a two car collision and subsequently closed, Willow Brook Bridge at Fotheringhay is again open to the public. A two car collision caused significant damage to the bridge in Nassington Road on Thursday February 2. 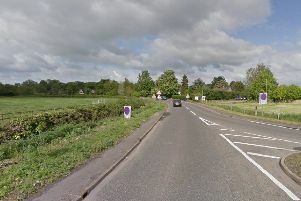 The closure not only caused problems for motorists, who were forced to detour via the A605 from Oundle to Peterborogh, it caused problems for local businesses too. Gary Johnson, who runs the Black Horse pub in Nassington, said the closure had dramatically reduced the amount of passing trade. Mr Johnson said: “It has been a nightmare. “It has also hit lunch times and early in the week hard. We are about 40 per cent down on last year, and I know other businesses in the village have been hit hard as well. “It has affected our staff as well. “This is my third year here, and every year my beer sales have gone up, my food sales have gone up. We took this pub from the bottom, and have made it a success, but this is difficult. “It is a tough time to run a pub at the moment anyway, without something like this. A spokesman for Northamptonshire County Council said: “The bridge over Willow Brook, just outside Fotheringhay on the road to Nassington, was badly damaged in February and closed for safety reasons. “The bridge is very narrow and it is too dangerous to have the road open, even for restricted traffic. “When undertaking any works on or around structures of this nature there are a number of activities, procedures and approvals that are required before works can start. Scheme preparation work has commenced to repair the accident-damaged parapet and we will continue our liaison with relevant partners.